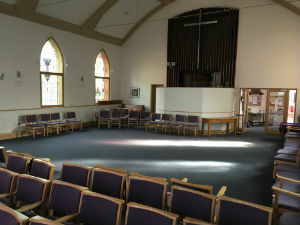 This can be configured with chairs in rows or with the chairs pushed back to provide a large space as in these photos. It is carpeted. 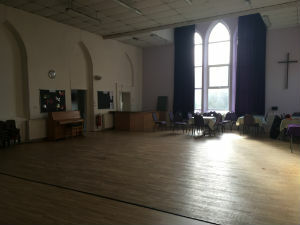 This large space can be set out with tables and chairs or left as an open space. It has kitchen access and a hardwood floor. 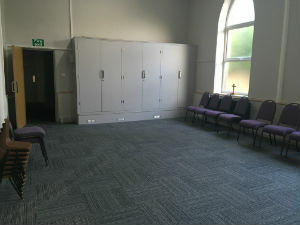 This space can take around 35 chairs in rows or can be left as an open space. 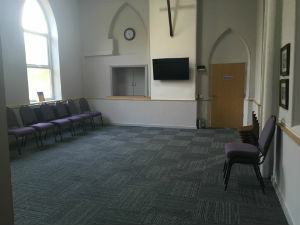 It is carpeted and has a large screen on the wall with internet access. 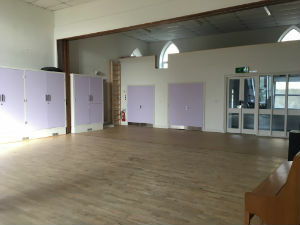 It has direct kitchen access and can be entered via a separate entrance if the main hall is in use. 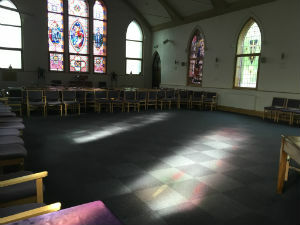 Currently we have good availability in all our spaces in the afternoons on all weekdays (until 4pm or 5pm) and on Thursday and Friday mornings; the Pendle Room is available in the mornings on Mondays, Wednesdays, Thursdays and Fridays and the Sanctuary is available in the morning on Mondays, Thursdays and Fridays. There is limited availability in the evenings. Click this link to see our online diary. For further information about availability and hourly rates, click on this link to send an email.